It was reported earlier this week that texting while driving is a major problem in this country – nearly half of all drivers admit to doing it. 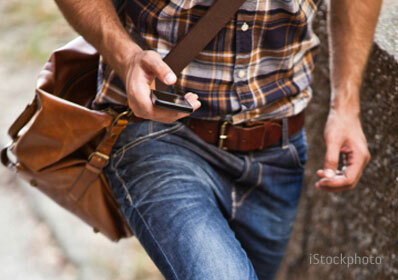 But did you know that texting while walking can be dangerous too? Or that mobile gaming can be dangerous? And also make you look really dumb? You don’t have to just take my word for it, though. Take a look at these five spectacular cell phone fails, all caught on video. As someone who’s accidentally dropped a 40-pound weight on his iPhone (don’t ask), I can tell you first hand what a hassle it is to lose a mobile device. But no matter how inconvenient losing your phone is, it’s nowhere near as inconvenient as getting hit by a train. So please, promise me – if your cell phone falls down onto the tracks as a train arrives, don’t jump down on the tracks to get it like this Brazilian woman did. It might end badly. Whenever I’m stuck on a subway or train, I like to spend a little bit of that time playing games on my phone. But I don’t enjoy gaming quite as much as the person wildly swinging his cell phone around in this video seems to. And given what happens to the man in the final seconds of the video, that’s probably for the best. Okay, okay, I admit it – I’ve had one or two accidental stumbles trying to text someone while walking. It’s always a little bit embarrassing when it happens. Thankfully, though, it’s never happened to me while on national TV. Take a look at what happens when an inattentive, texting woman encounters a small flight of stairs during a Canadian news report. The previous clip proved that it can be quite embarrassing taking a spill on television due to a cell phone. In fact, we dare say that the only thing more embarrassing would be if it was the news anchor caught in a stumble, and not just a nameless passerby. And that’s exactly what happens in this clip – an English news presenter walks right into an iced-over canal. Could someone hand this poor woman a towel? The worst part about stumbling into the fountain at your local mall isn’t that you get wet, you get your phone wet, or that a small crowd gathers to gawk. No, the worst part is that your fall will definitely get caught on security tape, and the mall’s guard will definitely upload it to YouTube with his own personal commentary. So, what did we all learn today? Primarily this: If you have a cell phone, take periodic breaks to pay attention to the world around you so you don’t fall into a landscaping feature. You’ll not only protect your expensive cell phone, you’ll also protect your dignity. Several years ago I was texting while I was walking away from a Sonic Drive-In and didn’t notice that I was coming to the 12” curb. Boom! Face first, but luckily quick enough to put hands out and blessed enough that nothing was broken; although I did sustain a very bad injury to my foot. We later went back I deduced that my injury was from the metal object sticking out on the sidewalk just before the curb. I ended up injurying my whole foot (the whole thing turned BLACK) and my Achilles tendon as well. We tried crutches but I am partilly disabled so I kept getting off balance and ended up having to use a wheelchair for about 3-3 1/2 months before it finally healed. No I don’t text and walk anymore, that was very painful and those people in those videos are very blessed that they were not hurt.